fight their common adversary: the Taliban and their Al Qaeda allies. to state-of-the-art warfare—must adopt the rudimentary tactics of the Afghan horse soldiers. vastly outnumbered and outgunned by a ruthless enemy that does not take prisoners. 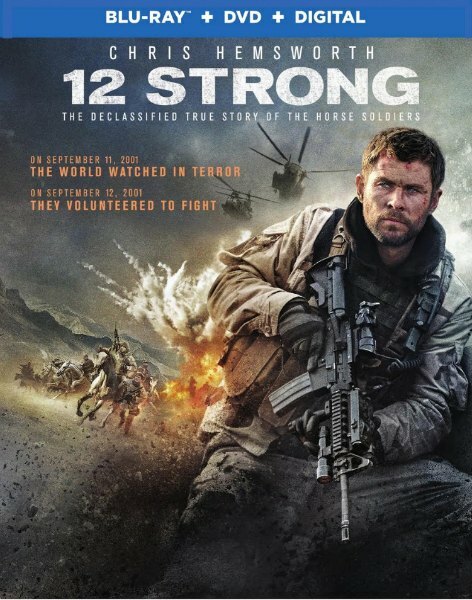 I have one copy of 12 Strong ( Blu-ray or DVD your choice! )to giveaway to one of my readers! US ONLY. 18 and over to enter! Giveaway ends June 10th at Noon. I would love to win! I am a subscriber. I love a good war movie. Would like to be entered to win. Thanks for hosting. https://twitter.com/BWallace1980/status/1001770660153253889 May 30, 2018 tweet. Yes please, any movie with Chris Hemsworth has my full attention…LOL, Though I think this one may be very hard to watch. I didn’t see it at the theater for fear it may be too overwhelming. I really want this movie and cant wait to watch it with my husband! Here is my tweet for 5/31/18 https://twitter.com/BWallace1980/status/1002127596199600129 Thanks for hosting. https://twitter.com/BWallace1980/status/1002492938495184896 Tweet for June 1, 2018. Thanks for hosting the giveaway. Yes… I WANT IT for a movie night with my lovely wife. I would love to win this for my husband and I can watch it together. vastly outnumbered and outgunned by a ruthless enemy that does not take prisoners. A must see movie for me. This looks like a movie I would enjoy.